The Friends of Stoke Common is a community group which was formed in 2008 with the help of TCV. Although Stoke Common is a place where enjoyable time can be spent out in the fresh air, it is also an important Site of Special Scientific Interest (SSSI), due to the rarity of Heathland habitat in the UK today. Since the City of London took over the ownership and management of Stoke Common in 2007, they have been working hard to restore the common to its former glory. 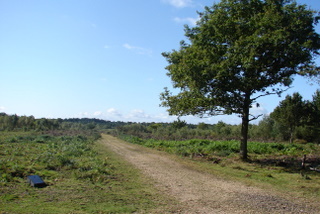 The Friends of Stoke Common aim is to assist the City of London in its plan to restore the common to a lowland heath and make it a better place for the whole community to enjoy. Our logo shows a sprig of common heather (Calluna vulgaris) in bloom. Twenty six of the plant species recorded at Stoke Common are considered to be rare or scarce on at least a Buckinghamshire County basis. A recent analysis by the local Environmental Records Centre of the number of County Rare and County Scarce plants recorded revealed that Stoke Common has more of these plants than any other site in Buckinghamshire. Read "Drone view of Stoke common"
Friends of Stoke Common's website is hosted by, but not compiled by TCV. The information contained on this website is for general information purposes only, supplied by Friends of Stoke Common. The views provided by Friends of Stoke Common are not representative of TCV. TCV is not liable for any loss or damage including, indirect or significant loss or damage, or any loss or damage whatsoever arising from loss of data or in connection with, the use of Friends of Stoke Common's website. TCV does not endorse, control or approve the content on Friends of Stoke Common's website.